We’ve all heard about rails to trails. How about roads to trails? That is what happened to the old Highway 1 through the scenic Devil’s Slide overlooking the Pacific Ocean. The state last year moved Highway 1 (aka Cabrillo Highway) up the slope and through a set of tunnels. San Mateo County restored the old highway as a 1.3-mile-long scenic trail for bicycles, pedestrians and equestrians that opened last week. When I bicycled through this area many years ago as I headed up the coast, I remember being struck by its awesome natural beauty. I also remember wishing I could pay more attention to the scenery as I clung to the right shoulder on this busy highway. That shouldn’t be a problem on the Devil’s Slide Trail. The route has been striped for a pedestrian walking lane and two bicycle lanes. There are three overlooks, but I’m sure people can stop anywhere to look over the rock wall. Turning the abandoned roads into bike trails has plenty of precedents. The longest one that comes to mind is the 13-mile stretch of the Pennsylvania Turnpike just east of Breezewood. The turnpike, with two tunnels, was bypassed in 1968. Lately, the route has been opened to bicyclists. Southern Alleghenies Conservancy bought the corridor for $1 in 2001 and Friends of Pike 2 Bike took over its management. One eight-mile stretch of the bike trail passes through two tunnels. More information and maps are available at Abandoned Pennsylvania Turnpike website and Wikipedia. Apparently some ownership changes are in the offing to win public funding for some upgrades. Another road-to-trail example is the Carbon River Road into Mount Rainier National Park, above. The two-lane blacktop road ran adjacent to the Carbon River since the 1920s, carrying vacationers to the Isput Creek Campground and to trailheads to the Carbon Glacier. The road was wracked by floods and landslides over the years, and the National Park Service decided in 2011 to stop fighting mother nature. 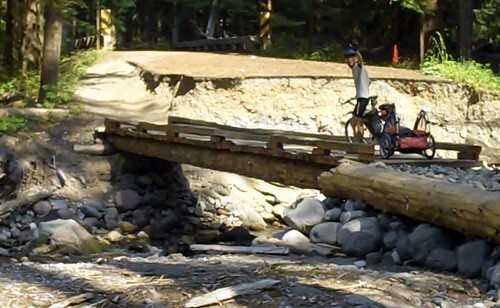 The road is now a 5-mile trail that’s open to hikers and bicyclists.